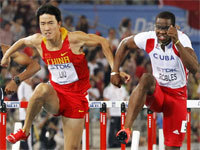 China’s former “triple crown” owner, hurdler Liu Xiang finished the 110 meters hurdles in the World Championships on August 29 with a silver in 13.27 seconds while the reigning Olympic Champion and current record holder Robles, who committed a foul on Liu, was disqualified by IAAF track referee council despite finishing home first in 13.14 seconds. U.S. emerging star Jason Richardson was profited with a gold medal in 13.16 seconds. Read more on this. China Women’s Basketball team won the gold medal in the 24th FIBA Asia Basketball Championship for Women in Omura, Japan, on August 28, and earned their ticket for next year’s London Olympics. Read more on this. LeBron James had his 2011 Greater China Tour with Nike, visited Taipei, Chengdu, Xi’an and Shanghai during August 11-18. In addition to James, Tyson Chandler, Chris Bosh, Amar’e Stoudemire and Kyrie Irving were at the Nike Festival of Sport in Shanghai to promote basketball. Read more from here and here. Kevin Garnett visited China’s Guangzhou, Wuhan, Shenyang and Beijing with his sportswear sponsor Anta during August 14-23. Read more from here. Derrick Rose visited China’s Guangzhou, Shanghai and Beijing on a promotional tour for Adidas during August 22-26. Read more from here and here. The Duke men’s basketball team finished their China tour on August 24 with three wins and a fantastic Chinese cultural experience under its belt. Read more from here and here. Former Spain Coach Jose Antonio Camacho signed a three-year contract on August 10th to coach China’s national soccer team as it tries to qualify for the 2014 World Cup in Brazil. Read more from here. World University Games concluded in Shenzhen, China with a closing ceremony on August 23. The multi-sport games were a big success for the Chinese city. It was recognized as a superbly organized championships. In a brand new stadium, which was filled daily with at least 30,000 spectators, several world class performances were achieved. Read more from here and here. Chinese property developer Shui On Land has become the title sponsor of the first ever China Golf Challenge. Click here for more. China LPGA Tour (CLPGA) appoints global sports marketing agency Octagon as the official marketing partner with a new multi-year deal. Under terms of the agreement, ‘Octagon will be responsible for developing corporate partnerships for the CLPGA and also will be involved in strategy development and planning.’ Click here for more.